Welcome to our pages...... 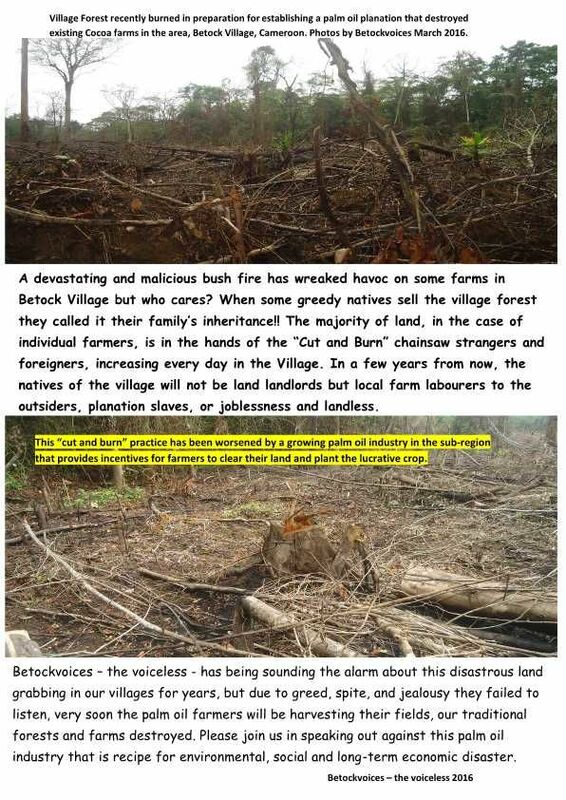 The Harsh realities of farming on native land, shattered dreams at Old Gloucester farms in 2016, the scream of fire that nobody heard or noticed for weeks in Betock Village, now's not the time for mixing words………….. the national media's failure to cover Indigenous communities and farmers makes them complicit in the human rights abuses and environmental crimes they fail to report on. After all, if no one tells us that a community is being displaced or that a rainforest is about to be razed to the ground, we can never know that it's happening. And if we don't know that it's happening, we can never do something about it. We are being denied that critical knowledge. Indigenous communities and farmers depend on us to make sure that everyone knows what's going on. We need all to make sure that we can. The palm oil industry is a recipe for environmental, social and long-term economic disaster. 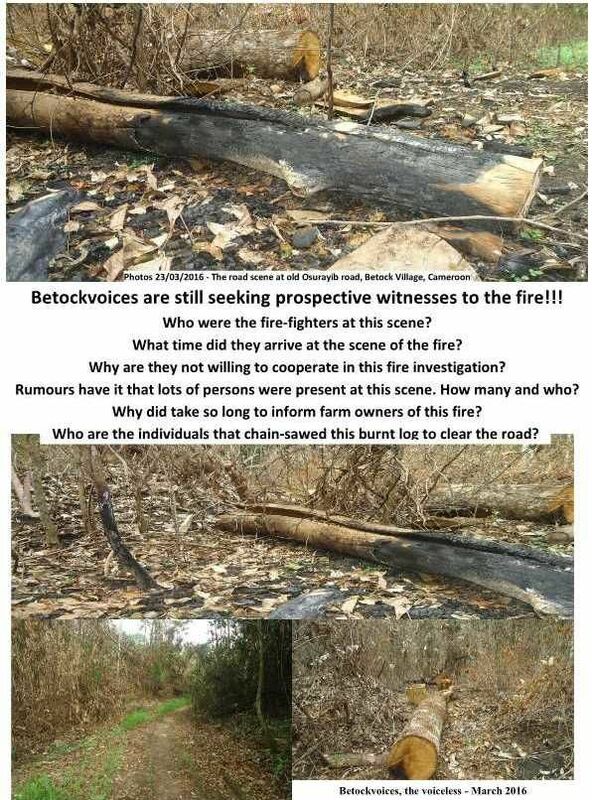 Photo from Betock Village 24/04/2016 - Forest destruction by rampant slash and burn practice by ambitious a palm oil farmer, and he wants more of our ancestral forest for further palm oil expansion. Please Note - we are not looking any financial support or would take it. We are only sharing our experience and information. Man-made bushfire for palm planting in Betock Village in Cameroon! That’s the reality on the ground. Photos of the root of the problem is the practice of forest clearance known as slash and burn, where land is set on fire as a cheaper way to clear it for palm planting. Palm oil has been the most profitable crop in recent years so much of the slash and burn is directed at clearing forest for palm plantations. The rampant slash and burn policy associated with the farming of palm oil is destroying large areas of this sub region. Believe us other crop farmers are danger losing their land by this policy. It’s all lip service stopping the palm oil industry’s destruction of our forests by others! 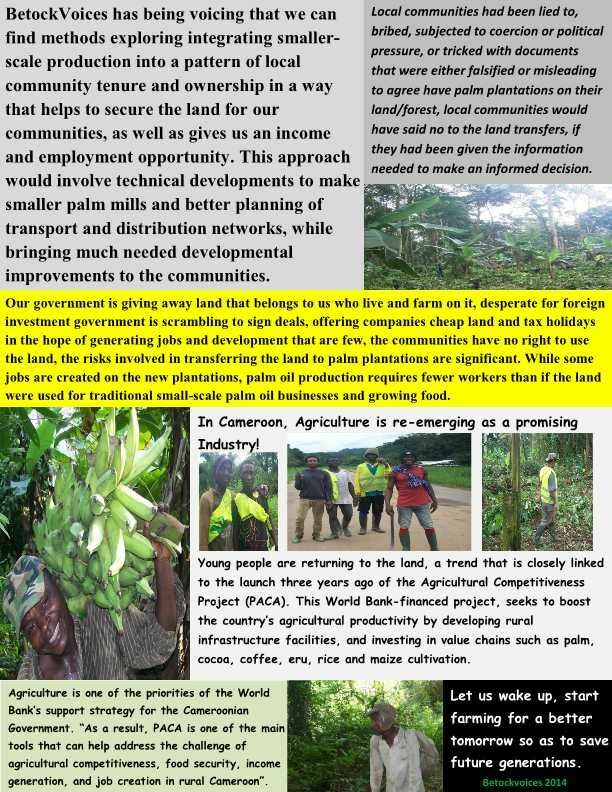 The Agribusiness is buying from them right now without stopping them from using the slash and burn, and these illegal palm farmers want land titles as they get more ambitious, and want more of ancestral forests, and take away from and abuse indigenous farmers. They are powerful. 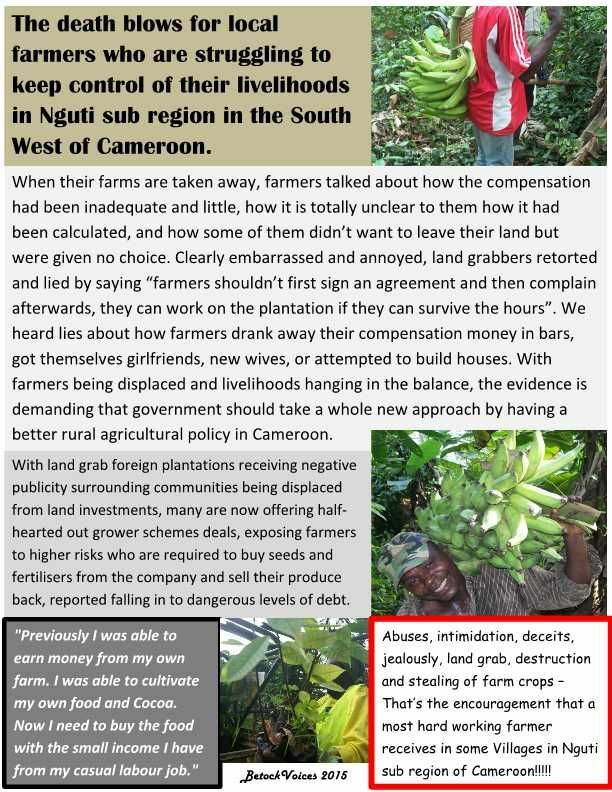 They are also wiping out traditional farmers in our sub region of Cameroon. 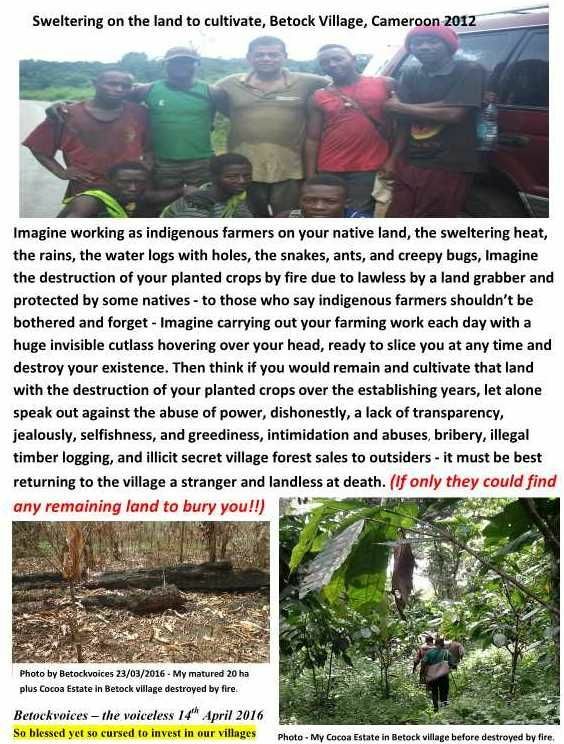 The cheapest method for strangers and immigrant workers is to grab land in our villages - clear the ancestral forest by cutting and burning it, a technique known as "slash and burn”. Our problem now is that the fire will get into the peat causing the fire to burn for months and the year is wasted.